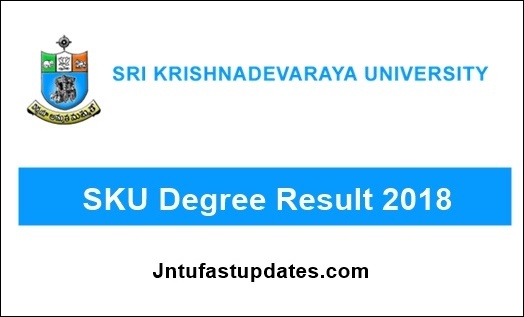 SKU Degree 1st, 2nd, 3rd Year Results 2018: SKU UG I, II, III Year BA, B.Com, BSC, BBM Results Oct/Nov 2018 are available at skugexams.in, manabadi, vidyavision.com. Sri Krishnadevaraya University (SKU) has Released the UG I, II, III Year BA, BBM, Bcom, BSC Results October/November 2018 at skugexams.in. Students those who are Attended these Degree Exams, may check their results from official portal. The Results of Yearly Examination Scheme (YES) are available in the website: http://skugexams.in for 2 months only from the day of publication of the results. For Revaluation/Personal verification, a separate application for each paper should be submitted directly to Assistant Registrar/ Deputy Registrar in UG Confidential Section only. The last date for Revaluation/Personal verification is 19-02-2019. The Revaluation/Personal verification fee of Rs.350/- per each paper should be paid to SBI Examination Account Number 34233445841 through SBI Challan only in any branch of SBI. No application will be considered either for Revaluation or Personal verification after the due date. Y exams are conducting very late?